This past week we concluded the second round of internal testing of our upcoming mods changes, have reviewed a number of points of feedback and are making changes thanks to our beta players. Earlier this year we added a number of new guilds to the beta program and are continuing to introduce more players and guilds to make sure we have lots of well-rounded feedback from the community. We have also just started using a smaller group of players to provide feedback on every build, given that recently we have had an uptick in bugs and issues that have not been received well by the community. All of this is to say, as we move forward, we are creating as many avenues as possible to listen to feedback, especially around changing existing systems like mods, which is why this update has been so long in the making. As we discussed in the Road Ahead blog post, we have several goals for our next big update for mods: clarity, ease of use, depth, and balance, while simultaneously respecting the investment made so far in existing mods. What follows is an in-depth description of these features, which may be a little lengthy and detailed for some, but we’re hoping will provide clarity to others. For this particular beta, we are allowing our testers to discuss their experiences testing the new update publicly so you may see some of them discussing upcoming changes on the forums. Over the next few weeks, we will be doing some videos (for people who prefer to watch than read) about how this will work. Check out this pinned post where we’re going to list new announcements and content related to Mods. Objective: Clarity These features are intended to make mods easier to understand and use. Currently, many players who would benefit from using mods are not using them, and we’ve heard from the community that one of the major issues is that they’re hard to understand. Basic vs Advanced Views: A Basic view of mods has been created to make the introduction to the mods feature more streamlined for novice mods players. In the Basic view players can Auto Assign mods using a mod recommendation system detailed below. Additionally, the mods inventory and stats are not displayed to reduce the amount of information being served to players in Basic view. Advanced view is similar to the current mods view that is live. You can view mods inventory, stats, and manually assign any mods in Advanced view. Note: The last view you had selected will be the view loaded when you return to mods. Recommendation System: One of the most difficult aspects of mods is understanding which mods to put on a character. The recommendation system simplifies this by suggesting specific mod(s) from the inventory to assign. The recommendation system identifies the best set, primary stat, and secondary stats for general use of that character. If the player has an available mod that is a “decent” to “perfect fit”, it will be recommended; if not, it will identify where that mod can be found. As this system provides an all-purpose set of recommended mods for general utility, players that are experts at mod optimization will likely continue to select their own mod configurations in Advanced view (especially if the player changes mods based on the game mode). Mod Auto Assign: This is a quick way to assign all the recommended mods for a character. When auto assigning mods, players can choose to have the algorithm not only search your mod inventory but also select mods that are currently assigned to specific characters and gives recommendations based on the best mods a player owns. Mod Energy: Mod Battles and Mod Challenges now have a different energy from Cantina Energy. The purpose of this change is to allow players to do Mod Battles and Mod Challenges more frequently without sacrificing progress in Cantina Battles. Cantina Tokens will be removed as rewards for Mod Battles and Mod Challenges although players will be able to get the same amount of Cantina Tokens using their Cantina Energy in Cantina Battles. Like ship energy, mod energy will not count toward the daily 600 (or else we’d be forced to increase that requirement). Objective: Ease of Use These features are meant for players that currently engage with mods but would like mod management to be easier. Mod Loadouts: Players can now create, edit and save sets (Loadouts) of mods for re-use across characters. This is a quick way for players to swap mods onto characters for different game modes. To make the process of creating mod loadouts easier, a loadout can be created based on the mods currently assigned to a character. Destroy button removed: We have removed the destroy button so players will no longer accidentally destroy mods. Mod Leveling Screen Improvement: Leveling a mod has been improved to allow selecting the desired mod level immediately without needing to tap "Select Level"
Objective: Depth These features are meant for players that would like to continue to make their mods stronger. When designing these features we focused deeply on respecting the investment that current players have already put into their mods. Mod Tier Coloring and Naming: One of the most confusing aspects of mods is just determining which mods are good in the first place. A mod’s Tier (Color) is based on the number of secondary stats when it is acquired. For example a Tier A (Gold) Mod has 4 secondary stats at level 1 where a Tier E (Grey) mod has no secondary stats at level 1. What is confusing is that we currently increase the tier (change the color) when leveling the mod. This results in all level 15 mods being Tier A (Gold) when there is a vast difference in the value of a level 15 mod that started at Tier A (Gold) vs one that started at Tier E (Grey). To better represent the value of the mod, we are no longer increasing the mod’s tier when leveling. We’re going to set each mod’s color to the tier of the mod when it was first acquired, however the mod’s stats will remain unchanged. This may be somewhat of a visual shock, but keep in mind that the stats are not changing through this update. We’d also suggest that until these changes go into effect, you may want to avoid mass selling your 5-dot mods, so you can make a more accurate decision about their value. Mod Slicing (upgrading Tier): We’re introducing a new feature, Slicing, that allows players to increase a mod’s tier. Slicing can only begin after a mod has been leveled to 15. Similar to crafting gear, Slicing requires new pieces of salvage that can be acquired through Mod Battles. This is a new battle tier (tier 9), so if you haven’t completed your Mod Battles yet, one way you can prepare for this update is to do that now. Once the salvage has been acquired, players then elect to slice the mod which will improve the mod’s Tier, increasing a random secondary stat and changing to the next color. This process can be repeated until the mod is at the max tier of 5A (Gold) which will have roughly similar stats to a natural 5A, but requiring the investment of slicing materials and credits compared to a natural 5A. For example, you can now take a rarity 5E mod (Grey) and increase its stats by slicing it four times to a max tier of 5A (Gold). Mod Salvage/Recipes: Slicing a mod will require Mod Salvage ingredients. The ingredients required will change depending on the Tier of the mod. Slicing to 6E: The primary reason we introduced Slicing was to find a way to introduce rarity 6 mods while respecting current mod investment. Rarity 6 mods will be acquired through slicing from Rarity 5, Tier A to Rarity 6, Tier E. This process increases all the existing stats on the mod. 6-E will be the highest that a mod can be sliced at this time. See the Balance section for more details. 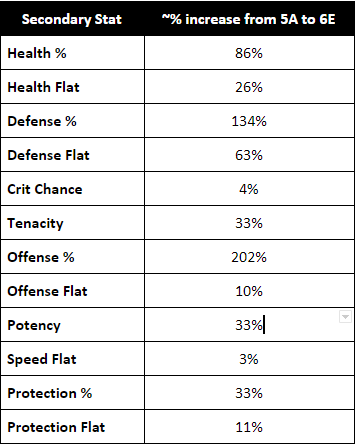 Objective: Balance Create more diversity in the mod meta by elevating some of the sets and secondary stats that are currently under-utilized. Secondary Stat changes are exclusive to rarity 6 mods. 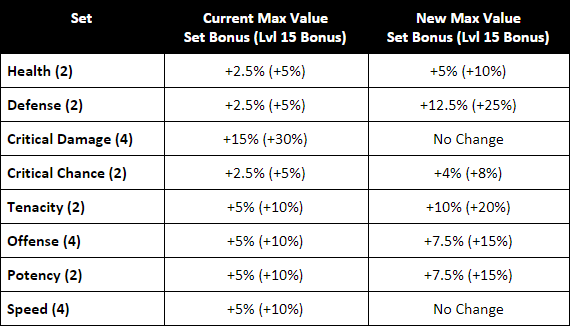 Max Level Set Bonuses: To give value to all mod sets, the set bonuses of under utilized mod sets like Defense have been improved. No sets have been decreased. 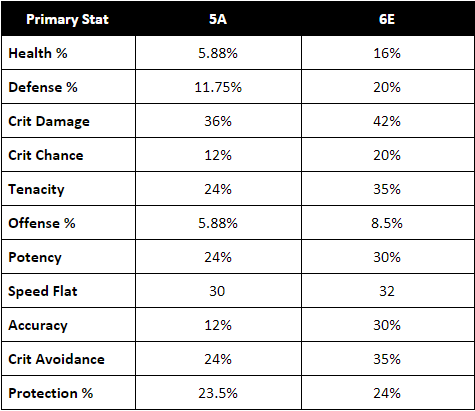 Rarity 6 Mods with Secondary Stat Balance: When a mod is sliced from 5A to 6E, all secondary stats will be increased by a multiplier to new 6E values. No secondary stats will get an additional roll at that time. In the example above, your Flat Health increases from 632 to 796 when you sliced from 5-A to 6-E.
Another important thing to note is that we didn’t change the relative range of possible values for your mods. A mod which has accumulated 30% of the maximum possible value at 5A, will scale to 30% of 6E’s maximum possible range when sliced. In short, top mods will still be awesome after slicing…and your not so great mods, though having higher stats at 6E, may still be candidates to sell. One step we are taking to make Mods more accessible is to reduce the cost of leveling a mod. Particularly before 85, the cost to level a mod deters many players from investing in mods even if it’s the best choice to improve their team’s overall power. This is already live as of July 25th. A secondary stat is then added or increased at level 3, 6, 9, and 12. 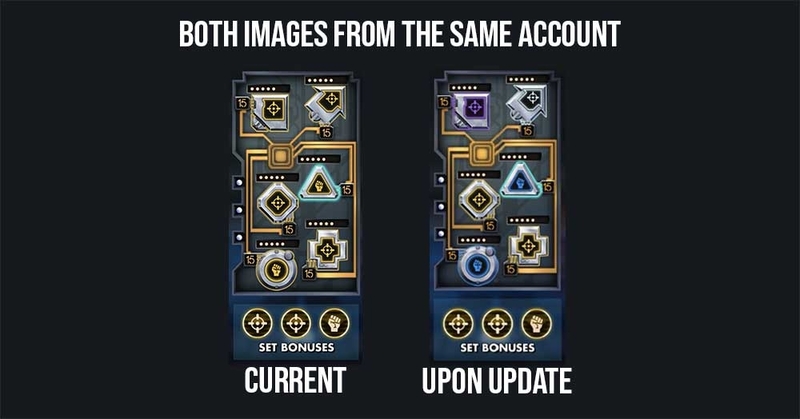 For Grey Mods this means that a new secondary is added at each of these levels and for gold mods it means that a random secondary is increased at each of these levels. This will not change. The change we are making is specific to green, blue, and purple mods. In the current system, these mods increase one existing secondary before revealing new ones. For example a green mod will increase its one secondary stat before adding the other 3. This gives the green mod some added value as it guarantees its first secondary to get an increase. The problem with this approach is that once Slicing is introduced, starting with a green mod that has a speed secondary, leveling it to 15, and then slicing it to gold will give better odds of a high speed mod than starting with a gold mod that has speed as one of its 4 secondaries. The change we are making is to always add secondary stats (up to 4) before increasing a secondary. This will ensure that starting with a green mod gives the same odds as starting with a gold mod, it will just take resources (ex. mod salvage) when starting at green due to the slicing materials that need to be acquired. There are still several weeks until we will be making this change. We implemented the lower mod leveling costs to give players time to upgrade their existing green, blue, and purple mods at a reduced cost prior to the change, so make sure to take advantage of the old system with solid green, blue and purple mods before this update happens. Particularly those green mods with a speed secondary! Another step toward making mods more accessible is making it easier to acquire mods. We have taken steps in the past to do this such as moving to a 100% drop rate on Mod Challenges and are now going to take another step in accessibility by removing the specific character requirements on Mod Challenges. While we recognize the investment many elder players have put into these characters, a combination of data and player feedback is showing that a major reason why players are not engaging with mods is that they don’t meet the character requirements to do the challenges for more desirable mod types, such as Critical Damage. For a player getting started on Mods, there is a large barrier to entry of getting the required characters, even before beginning the search for a set of “perfect mods”. This results in new players having to make a hard choice between investing in the characters that best help their guild, such as characters needed for Raids/Territory Battles/Territory Wars/Legendary Events or to invest in characters for Mod Challenges (like Jawas). We believe that the sooner a player starts engaging with mods the sooner they can start making meaningful contributions to their Guild and this change will enable those contributions. Complete Mod Battles in preparation for tier 9. Level up your Green, Blue or Purple mods if you want to take advantage of how revealed substats are currently leveled into prior to the upcoming change. Hold off on selling lower level mods until slicing is available.